A morganatic marriage is a marriage contracted between a member of a royal or noble family and someone (typically, but not necessarily) of lower status, in which the spouse and any resulting children have no claim to royal or noble rank, title, or hereditary property. Another term for a morganatic marriage is a left-handed marriage, stemming from the custom of the groom extending his left hand, rather than his right hand, to the bride. Morganatic marriages primarily took place in the Germanic areas of the Holy Roman Empire and its successors between the 15th and 19th centuries. Morganatic marriage originated in the law of the Lombards, a Germanic people who ruled much of Italy from 568 until they were conquered by Charlemagne in 774. Feudal German society was divided into legally defined classes: upper nobility; lower nobility; burgher; peasant. Each class had specific rights and obligations, and people were expected to marry within their class. A morganatic union enabled royals and nobles to marry someone of lower status. Morganatic comes from the German word “Morgengabe” which means “morning gift.” It refers to the dowry given by the husband to the wife on the morning after the wedding. The idea was that the wife’s and the children’s share of the husband’s estate was limited to this dowry. By the 15th century, morganatic marriage had become a legal tool in many of the autonomous German territories of the Holy Roman Empire. Since feudal law required land to be divided equally among male siblings, morganatic marriage offered a method by which noble families could reduce the fragmentation of their estates, by confining inheritance to one or a few sons. Even if younger sons married someone of the same class, the claims of their offspring could be limited. Second marriages, where there were already heirs from a first marriage, were also commonly morganatic marriages, for the same reason. A morganatic marriage was also a way to sanctify a relationship with a mistress. Morganatic marriages tended to be love matches, as indicated in these observations by a British visitor to Austria in the 1830s. By the 20th century, morganatic marriages had become increasingly rare. 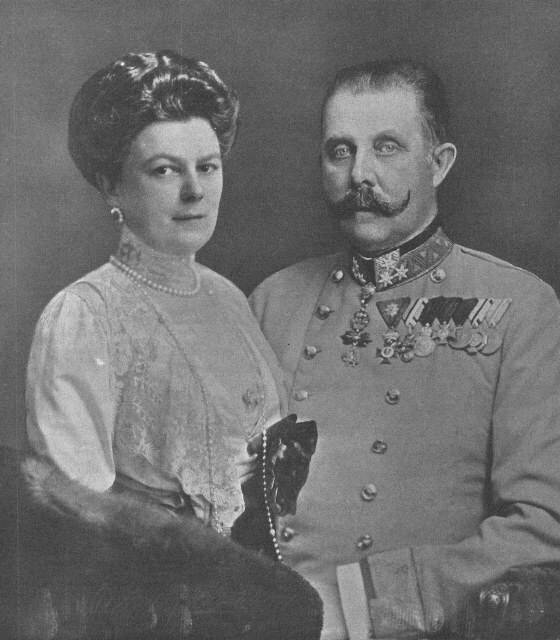 One of the most famous was that of Archduke Franz Ferdinand, heir to the Austro-Hungarian throne, to Sophie Chotek, Duchess of Hohenberg, on July 1, 1900. They were both assassinated at Sarajevo on June 28, 1914, thus triggering World War I. In 1936, King Edward VIII proposed that he be allowed a morganatic marriage to Wallis Simpson, as a way of getting around the fact that a British king could not marry a divorcée. But morganatic marriages are not part of British law, and this option was rejected by the British cabinet. The King abdicated to proceed with his love match. Morganatic marriage did not exist in French law. However, historically in the French royal family there were “secret marriages” that were similar to morganatic marriages. These were authorized by the king, but not officially acknowledged; they took place in private, and the wife did not assume her husband’s rank, title, or coat of arms. An example is the marriage of Louis XIV to Françoise d’Aubigné, Marquise de Maintenon, in 1683 or 1684. Napoleon took a commanding interest in marriages within the Bonaparte family, wanting to be able to select, or at least approve, spouses for his siblings, especially his brothers. When he became Emperor of the French in 1804, Napoleon specified in the imperial constitution that princes of the imperial family could not marry without the Emperor’s authorization. Should an unauthorized marriage take place, both the offender and his descendants would be deprived of their rights of inheritance. A decree of March 30, 1806, further stated that unauthorized marriages would be considered null and void, and that any children of such marriages would be deemed illegitimate. Napoleon tried to convince his brother Lucien to give up his wife, Alexandrine de Bleschamp, the widow of a French banker. Lucien refused. He and his children were barred from the imperial line of succession. Napoleon had more success with his youngest brother Jérôme, who quickly renounced his first wife, the American Elizabeth Patterson, upon being threatened with the removal of imperial privileges. Napoleon married Jérôme off to a German princess, Catharina of Württemberg, who died in 1835. In 1840, Jérôme contracted a morganatic marriage with a rich Italian widow named Justine (Giustina) Bartolini-Baldelli. This ensured that Jérôme’s title and privileges as Prince of Montfort – granted by Catharina’s father – and his claims as a Bonaparte would not extend to Giustina or any children (they never had any). Another notable morganatic marriage connected with Napoleon was that of his widow Marie Louise, an Austrian Habsburg princess who was then Duchess of Parma, to Austrian nobleman Count Adam Albert von Neipperg, who appears in Napoleon in America. They wed on September 7, 1821, four months after Napoleon’s death. At the time, Marie Louise already had three children with Neipperg. Neipperg did not become Duke of Parma, and the children were not given Habsburg estates. On February 17, 1834, four years after Neipperg’s death, Marie Louise married French Count Charles René de Bombelles, in another morganatic marriage. Austria and the Austrians, Vol. I (London, 1837), pp. 247, 250-51. Loved this topic, thanks. It is somewhat strange that Napoleon took a powerful interest in the marriages of his brothers, but even stranger that they listened to him. Morganatic marriages were to limit the inheritance of not-quite-royal-enough spouses and children. Not to limit the royalness of an army cadet from Corsica and his siblings. Thanks, Hels. Glad you liked the article. In addition to considerations of political alliance, I think it was because of his non-royal background that Napoleon wanted to marry the Bonapartes (including himself) into European royal families. He craved “legitimacy,” which he thought would inhibit other rulers from toppling him. Tragedy that a great man could not see all this was nonsense. “Montenuovo” is the Italian translation of “Neipperg.” But they were just Counts. Marie Louise’s oldest son was elevated to Prince of Montenuovo by the Austrian Emperor in 1864, which was a new title in Austrian “peerage”. This is fascinating! Thanks so much for sharing it. I love this blog! Thanks, Hunter. I’m glad you enjoyed the article! Archduke Franz Ferdinand was my great grandfather. How interesting, Craig. You certainly have a noteworthy lineage. Some members of the royal family have had the philosophical courage, at the expense of princely dignity, to marry those they loved and with whom they knew they could be happy, rather than ally themselves politically with those with whom they might probably have no community of feelings, affections, or ideas.